I have been getting asked how someone could be part of dirty smith or get more out of it. So in response to the audience I setup a Patreon account. What is Patreon? 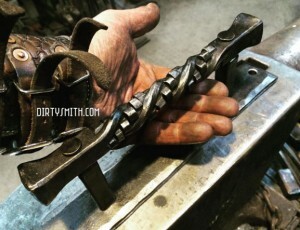 Its compared to GoFundME where its a crowd funding source, yet it is geared towards content creators like myself, I do blacksmithing tutorials. In the account you can set your amount and receive a variety of rewards, such as: a sticker pack, a sketch by me, shout outs on YouTube and of course the universal high five and/or hug if we ever meet. This allows me to focus on an audience like a client and allows Dirty Smith to be influenced and directed by those who want to participate. Yet, if you choose to not participate please dont worry. Nothing is going to change. Forging Fridays will stay the same, Dirty Smith shirts will still be available, etc. Also if the patreon hits $500 I will produce a podcast as well. Here is the catch with the account. I only receive the donations when I produce the content. So, for example, if I am in a situation where I am unable to make a video, then I don’t get paid. Also you can put a cap on how much a month your account can donate, and I plan to only produce content worth paying for. I wont waste anyone’s donation with bull crap. But if you decide you no longer want to participate, you can withdraw your donation any time. No fees, no contracts. Seems fair. That’s why Im doing it and have the best intentions to provide to those who are willing to be part of Dirty Smith. This is also open to companies who would like to sponsor. You can see the packages HERE I will also be developing these packages as time goes on. A side from Patreon, I will also be offering an “advising package.” Some come with whole projects that they need to do and have lots of questions. These take time and could totally offer my experience of forging / building and help you figure out the details. Ill be updating that when it is ready. Im planning on a Skype system and/or even a screen sharing system where we can look at the details, point, grunt, clang digital beers, dirty jokes…you know…typical problem solving. The youtube channel is almost to 10k subscribers! Who would have imagined in a years time how that would grow! I am totally excited and have a list of free tutorials lined up. I also have a big plan to do a 50% off all shirts as a thank you when we hit that 10k subscriber list. Also new shirts are in the works and think I have some cool ideas worked out that will read well for the modern blacksmith. The older designs will still be available but may be modified a little to compensate with the new print shop I am teaming up with. I was invite to demo and talk at the Makers Fair in Rochester, New York in November. I will keep you up to date on that and when if and when the details are final. So far it looks like a go but I haven’t heard any final details yet. Once again thank you for the support! Looking forward to a great 2016.